The Ramsdens Cup final has never known such a high-profile. The involvement of Rangers has raised its prominence, and the Raith Rovers players have been drawn into the media spotlight. The tournament is secondary to the other national cup competitions, but the occasion of the final can still be intriguing. From the Ibrox squad, the message is that the game will be treated seriously in its own right, that a club that has measured its eminence in the past in top-flight titles, Scottish Cup and League Cup triumphs will still value a competition that is only open to lower league sides. From the Raith Rovers players, the assertion is that they will not be overawed by the occasion and they will go into the game believing they can win. Scottish football has come to terms with the lopsided nature of games involving Rangers. They are, after all, the League One side playing a team from the division above, but they are the favourites, having the greater resources and a squad containing players of top-flight experience. It is a measure of Rangers' circumstances, this pursuit of silverware, that the Ramsdens Cup final will deliver a trophy but the Scottish Cup semi-final against Dundee United the following Saturday will seem a more urgent assignment. Ally McCoist has insisted that he will not be influenced by the challenge of the United tie when he picks his team for the cup final. The Rangers manager understands the need to develop a hardened winning mentality amongst his players - supporters will rail against a defeat at Easter Road against Raith Rovers, and they queued early in the morning at Ibrox when the tickets went on sale - but also that his team will be assessed and scrutinised more intently against United. This spell in the lower leagues is a challenge to the Ibrox club's esteem, since they are in pursuit of a return to the top-flight but have to treat every step with the appropriate intent. They will hope to only experience the Ramsdens Cup once more, since the overriding ambition is to gain promotion next season from the Championship. That is why the United game feels so pertinent to the Ibrox side, although the fresh hostility between the Rangers fans and Dundee United brings its own edge to the game. It is into this balance that Raith Rovers hope to express their own ambitions. This is the first cup final since Jimmy Nicholl managed the team to victory in the League Cup final against Celtic at Ibrox in 1994. That triumph still resonates, and the Ramsdens Cup final seems timely when the anniversary of that glory is imminent. "It's been mentioned in passing, but there are reminders of it all round the club, like pictures on the walls, it's a big part of the club's history," said Grant Anderson, the Raith Rovers attacker. 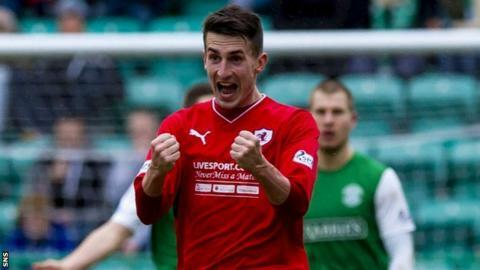 "It's always there in the background and you know what it meant for the fans and Kirkcaldy. "Both teams are going to be hungry to win the cup because every player wants to win silverware. But it could be your last cup final as a player, so I'm desperate to win it. I'm sure the Rangers team will be desperate to win it." Easter Road will be full on Sunday, while Ibrox will host a near sell-out crowd the following weekend. These occasions make demands of players' temperament and mentality, but Raith Rovers knocked Hibernian out of the Scottish Cup earlier in the season - with Anderson scoring the winning goal - and subsequently pushed St Johnstone hard in the quarter-final. Most of the Rangers players, though, have not won many tournaments in their career, so personal ambition is relevant. Even so, the most decorated player in the Ibrox squad, the captain Lee McCulloch, is motivated by the opportunity to win every senior prize in the Scottish game, which he would achieve if he wins the Ramsdens Cup and the Championship title. "You've got to go into every game confident," said Anderson. "We've not been in the best league form, but you don't take that into account going into a cup competition. This is going to be different. Everybody's going to be much more up for it, it's going to be fast, frantic and I don't think the league form will have much to say in this game. "The cups have been good to us and hopefully we can continue that. If it went down to penalties and we won it, if it was an unattractive game all over and we managed to win it, we'd take that no problem. We've practised penalties in training this week, so we've prepared for everything." The final stands alone for Raith Rovers, yet is one part of a contrasting week for Rangers. Both teams need to come to terms with those circumstances.